A rooster is known as a brightly colored domestic fowl that crows to signal the sun has risen. 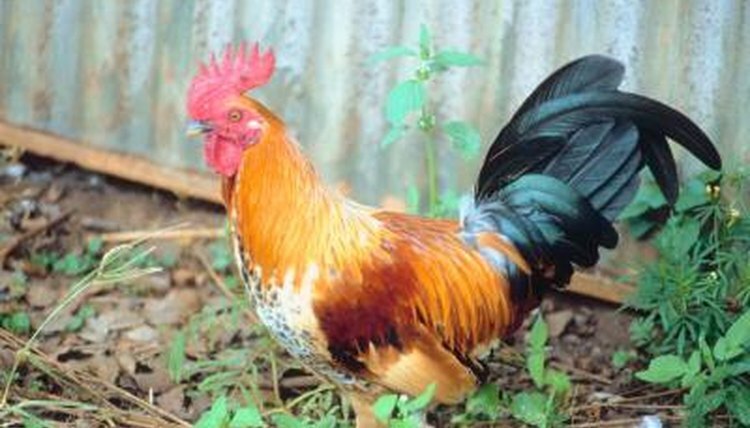 One of the main differences between a rooster and a hen, other than coloration, is the presence of long, sickle-like tail feathers. Looking at the ancestor of the chicken, a bird called a jungle fowl, it becomes obvious that today’s rooster has not changed much in the last 10,000 years, especially in how they use their tail feathers. Domesticated roosters and their wild ancestors both use their tail feathers in the same way while on the ground. Both kinds are designed less for flight and more for running away from danger. Their tails help with balance while they walk or run. In some cases, a crooked tail on a rooster will alter his balance and is not a desirable trait, when born this way, for breeding. The domesticated rooster is heavier built due to how humans have bred it over time for its meat. The jungle fowl is leaner and lighter. This is important because it means that the jungle fowl can fly higher and for longer than its domesticated cousins. Chickens and roosters also fly, but not very far or high. When the rooster flies, however, the tail acts as a rudder and aids it in up, down and side-to-side motions. Jungle fowl and domesticated chickens, like many other bird species, are sexually dimorphic. What this means is that the female and male look different physically. Domestic roosters and their wild ancestors are brightly colored and flashy to help them attract the attention of the females during mating season. The tails are part of their showiness and help the jungle fowl dip and dance to entice hens to become part of his group. Though this may be seen less in domesticated roosters, their genes still give them the tails and other feathers necessary to impress their potential mates. Rooster tails have caught the attention of humans for a very long time. People who water ski or enjoy boating may have heard the phrase spoken of in regard to the plume of water that shoots up and out from the back of their vehicles while on the water. This fascination with roosters has led to the selective breeding of longer, brighter tails for aesthetic purposes. People want to see a different type of tail, and so they breed chickens together to get that particular type of tail. For domesticated roosters, a tail is less important to its survival than it is to its breeders.